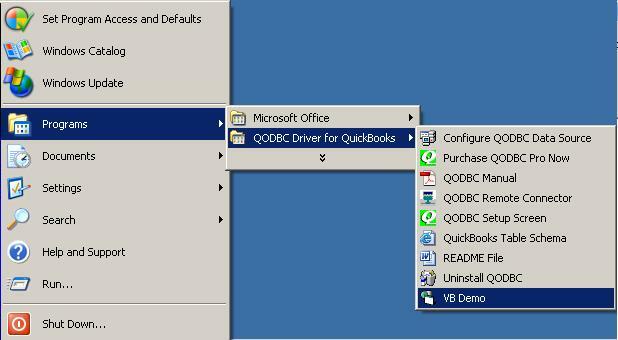 Once the FLEXquarters QODBC Driver for QuickBooks has been successfully installed on your computer, you can begin to use it immediately using the FREE "once off" 30 Day QODBC Server Edition Evaluation mode. 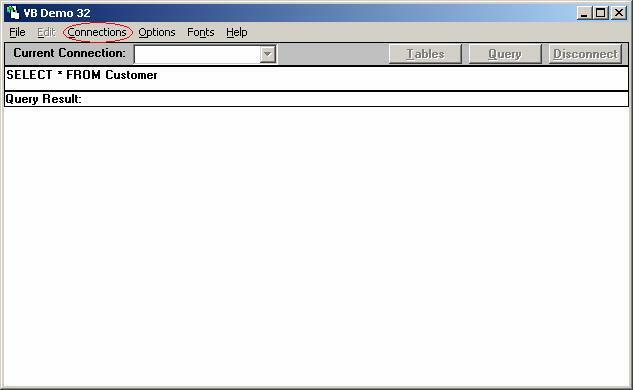 To start using QODBC, you first need to run QuickBooks on your computer logged in as an Administrator and open your company file, or one of the sample company files that came with QuickBooks, as shown here. This is for security reasons. 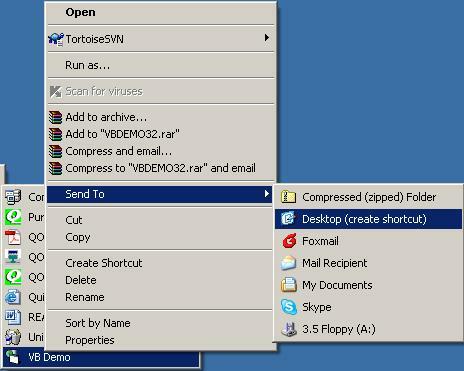 You can right-click on the VB Demo --> Send To --> Desktop (create shortcut), create a VB Demo shortcut on Desktop, then you can start it by clicking the shortcut only. Click on the VB Demo icon to launch the Visual Basic Demo program supplied with QODBC. 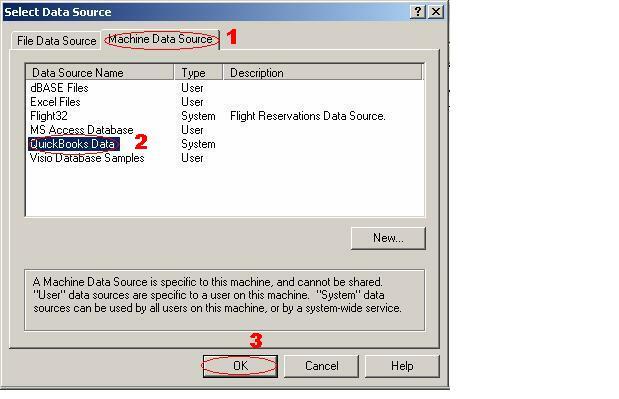 Select the Machine Data Source tab and QuickBooks Data System DSN, Click OK. 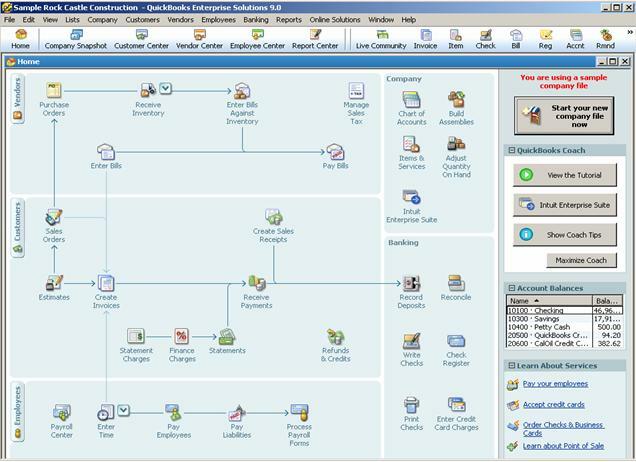 This will connect you to the current company file opened by QuickBooks after you click OK.
Before connecting to QuickBooks, you should check whether QuickBooks is already installed on your computer, if not, please install QuickBooks first, and start QuickBooks before using QODBC, then try to connect it again. Or please see Troubleshooting: Begin Session Failed Error=80040154 for more. Before connecting to QuickBooks, you should check whether your QuickBooks is running, if it is not running or not opening successfully, please check the reason and make sure it running, then try to connect it again. And also we kindly suggest you make sure you have selected the "use the company file that open......." option in QuickBooks Setup Screen -> General page. You have to authorize QODBC to log into QuickBooks automatically. To do this you must restart QuickBooks and log in as an Administrator and then follow the instructions below. 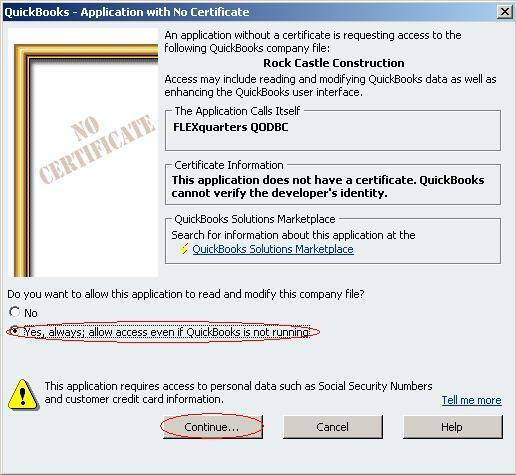 When QODBC starts, QuickBooks will ask you permission for this driver to access your QuickBooks data. Check the Yes, always allow access even if QuickBooks is not running options and Click Continue to this and the QODBC driver is added to the Integrated Application list. Confirm that you want to allow this access by clicking on Yes. This will allow applications to integrate with QuickBooks data when QuickBooks is running on the desktop. Check the information, if it's right for you please click Done button, if it's wrong for you please click Go Back. From the QuickBooks Edit menu, select Preferences, and then select Integrated Applications. There are often instances in which you want an integrated application designed to share data with QuickBooks to access QuickBooks files automatically, without user intervention. This might permit, for example, a particular application to run during the night when there is no other activity in the company file. Also, QuickBooks doesn't need to be running in the foreground for ODBC compliant applications to access the data files using QODBC while setting in this mode. Click the Company Preferences tab and make sure that the Don't allow any applications to access this company file checkbox isn't checked. 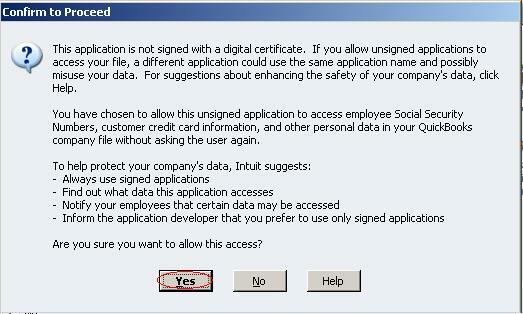 The Notify the user before running any applications whose certificate has expired checkbox can be checked. If it is, however, automatic access will be suspended if the application's certificate expires. 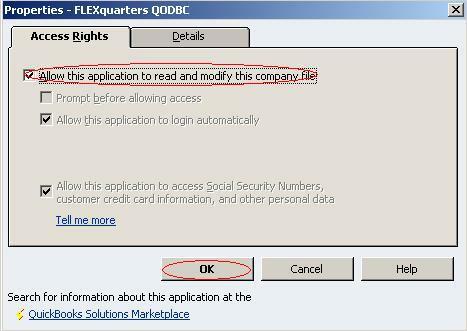 Select the FLEXquarters QODBC driver you want to run automatically and click Properties. Make sure the Allow this application to read modify this company file checked. This procedure needs only be done once for each QODBC application to be able to connect with the QuickBooks data from any other ODBC compliant application in the future. Now that you have successfully established a connection to your QuickBooks data, it's time to type in your desired SQL query, for example, you can use the default "SELECT * FROM Customer" or type in another table like stock by entering "SELECT * FROM ItemInventory". Click on the Query button and the requested query results will appear! In case you're wondering, the * in the select statement means all columns in that Table. 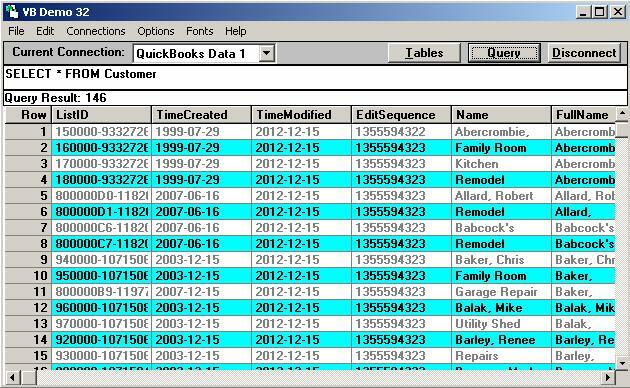 Alternatively, click on the Tables button to see a list of all the available QuickBooks tables. 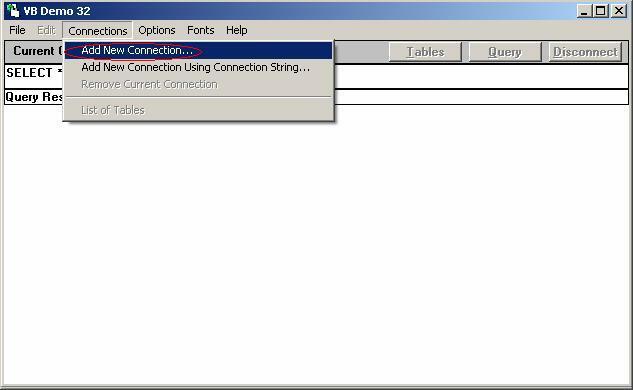 To disconnect, you can either select Connections --> Remove the connection or Click the Disconnect button. Go to: How to setup the QODBC Optimizer and Where are the Optimizer options for the next step. 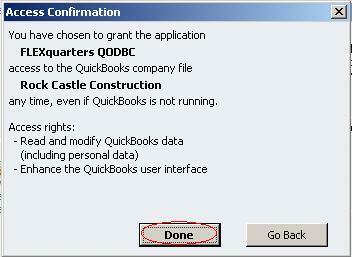 You can also see: How to setup QODBC for Auto-login into QuickBooks for more details. Now we know who the snseible one is here. Great post!